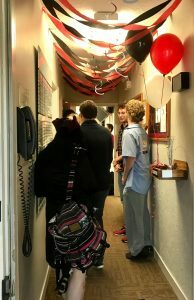 North Central College’s WONC 89.1 FM celebrated two milestones at a daylong party last Friday. The award-winning campus radio station marked 50 years on the air while also bidding farewell to John Madormo, the longtime manager and NCC assistant professor of broadcast communications who is retiring after 38 years at the station. As current and former WONC staffers gathered nearby to celebrate, Madormo reflected on his nearly four decades on campus, which was preceded by work as a WGN-AM producer. “I thought I would stay for five years then go back to commercial radio, and then after five years I knew this was my home,” Madormo said. Over the years he has earned the respect of students and faculty alike. His instruction and mentorship helped WONC earn a full case of awards and motivated students to push for more. But, Madormo doesn’t take the credit, he believes the students’ constant devotion and desire is the force behind it all. 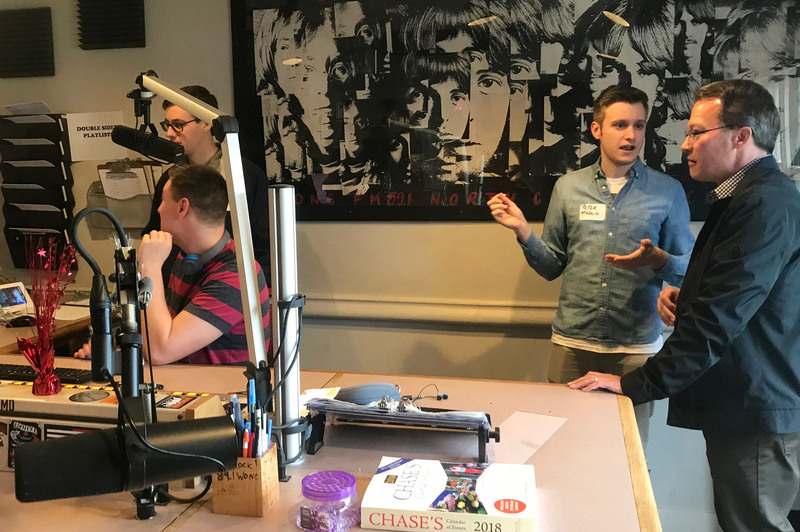 Alumnus Matt Freeman found himself laughing and reminiscing inside the station as he noticed the similarities and changes since he was a student. “You walk in and everything still feels the same and smells the same, but of course, having all these new faces and students carrying on the legacy is great,” Freeman said. He worked at the station as the production director during his last two years of college, from 2004-06. He remembers the importance of the first time Madormo gave him advice about his work. “My first time that he checked my broadcast in his office he said ‘Matt, you’ve got a lot of energy, you’re great. You just need to slow down and take your time.’ So, slow down and take my time, I think that carried me through my four years, just a simple sentence,” Freeman said. He explained how Madormo’s words stayed with him far past that day and into work, relationships and his everyday life. “Now being a dad and a husband, he spoke to my life on a number of levels. I can’t thank him enough,” Freeman said. WONC held the 50th anniversary party spilled outside the studios, located in a renovated house on Chicago Ave. The station features an album-oriented rock format as well as play-by-play broadcasts of North Central College sporting events. It has a 1,500-watt signal that covers most of the western suburbs but has also been said — depending on conditions — to reach as far as downtown Chicago. WONC also serves a potential worldwide audience a via web site and streaming services. NCC sophomore Matt Hehl has been with WONC for more than two years and considers it his home away from home on campus. He looks to Madormo as a mentor who was always willing to help him. “He makes sure I not only set my goals, but I reach them. 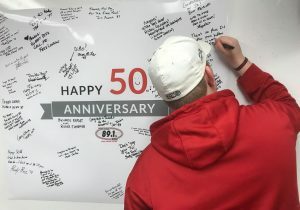 That’s not something that can just help me here at the radio station, that’s something that can help me the rest of my life,” Hehl said. 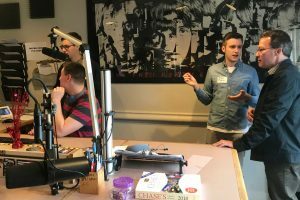 For these students, the radio station serves as a place where creativity can thrive, a place where they can build friendships with people they call ‘family’ and at the root of it all. Madormo brought them all together. As his final days at NCC are upon him, what will he miss most?